Here I've rotated the sketch on it's side to give it a different look. The BG on my mustard card stock is created using the Watercolor Distress inks - normally I do this tech on white or watercolor card stock, but here on the mustard it gives the shabby distressed look I was after. Here's MJ's original sketch - if you'd like to play along you can leave your link on this post - or if you upload to SCS, use keyword TSSC24. OMG, I love that TROPICS set!!!! That's so cute. Love the color combo! So cute! I am loving both cards but I especially love the sketch flipped. So cool how different both look. Great job as always, thanks for playing. Cute cards Lisa, I love the first one! 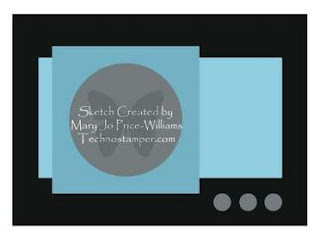 The sketch looks great rotated - Love that card!!! Great cards, Lisa! The sketch looks great rotated also! Lovely card for the sketch, Lisa! You have found some real nice new one. Love the luai one!! Ohhhh! 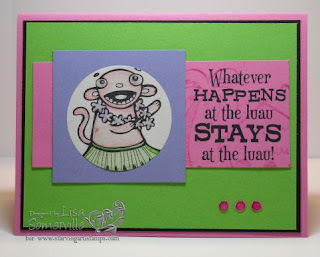 That little luau guy is just a riot!! Definitly a cutie!! 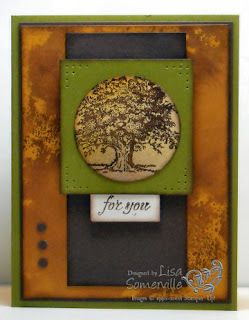 Of course, the Lovely as a Tree card is fabulous....can never go wrong with that set. So glad it is not being retired!